Unity’s Personalized Placements optimize revenue by intelligently serving a mix of engaging content to the right player at the right time. Get to know the various content types, and learn how to deploy them in your monetization strategy. AR ads offer players a fully immersive and interactive experience, by incorporating digital content directly into their physical world. Players can make new, memorable experiences, while feeling a sense of agency by creating their own narratives. To implement AR ads in your game, see the integration guide below. Banners remain a consistent source of ad revenue within mobile ad spend. Unity Ads now supports Banner Placements for all publishers looking to integrate them into their games. 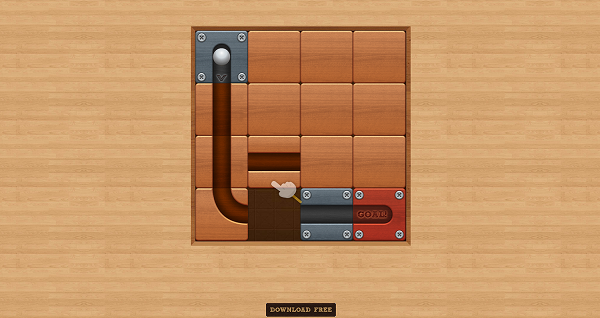 Display ads are the basic full-screen interstitials that persist until the player dismisses them. These are most effectively implemented strategically at natural pauses or breaks in gameplay, such as a load or level change. 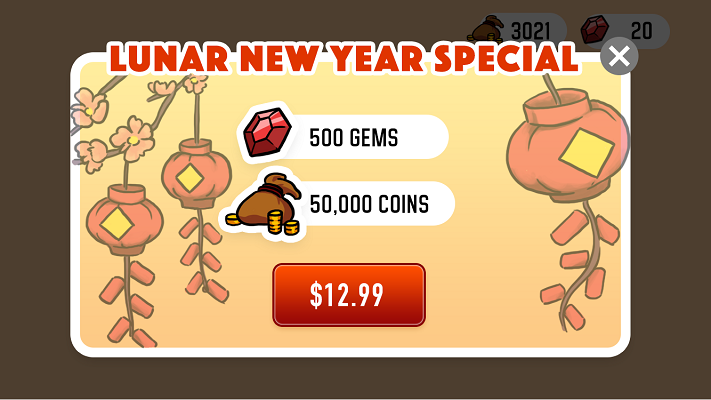 IAP Promos surface promotional assets for in-app purchase opportunities throughout your game. They generate revenue by driving traffic to your in-game store, and calling attention to attractive offers. Simply set up your Placements and configure your Product Catalog, then let Unity’s machine learning data model do the heavy lifting of delivering the right offer to the right player at the right time. Playable ads are ad units that enable the player to engage with the ad content through interaction. You can implement Playable ads through both rewarded and non-rewarded Placements. Video ads are the most common form of advertising, and recommended in our best practices guide. They create opportunities to implement rewarded ads, where players receive incentives for viewing the ad in its entirety. Introduce users to your other apps. There is no opportunity cost, because Cross-Promotions only appear when there are no other ads available to fill. Boost your impressions and ad requests, which can lead to additional installs. See the Cross-Promotion setup guide below for more information. Download and install the latest SDK (Unity | iOS | Android). Configure your Project to access device camera permission settings. Create a Placement and associated script to receive and display AR content. Contact the Unity Ads team to enable AR ads for your Project. Warning: Games directed at children under 13 are currently not eligible to enable AR ads. This section details setting your Project up for Unity integration. If your game already uses AR functionality, skip to the Implementation section. AR ads require access to the device’s camera. When configured, the Unity Ads SDK can handle this permission query. In the Unity Editor, select Edit > Project Settings > Player. Select the iOS icon in the platform tab menu and scroll to the Other Settings section. Find the Camera Usage Description field and enter a description of why the game needs to access the device’s camera. Unity recommends "For AR ads display". For more information on this setting, see the iOS Player Settings documentation. Access the Maven repository here. Select the .aar button listed under Files. Place the .aar file in your Project’s Assets/Plugins/Android directory. Contact Unity requesting a custom Android Manifest (AndroidManifest.xml) with the modifications required for AR ads to work in your Project, and a project.properties file that enables loading the Android Manifest. Unzip the provided UnityAdsARConfigManifest.zip file, and place the resulting folder in your Project’s Assets/Plugins/Android directory. Important: Google requires end-users to explicitly grant camera permissions. By default, Unity AR ads-enabled games on Android request that permission when the game starts. If you choose to postpone the permissions query, you may do so by changing the unityplayer.SkipPermissionsDialog value in the Android Manifest to true. However, this setting controls all of your game’s permission queries, not just the camera. 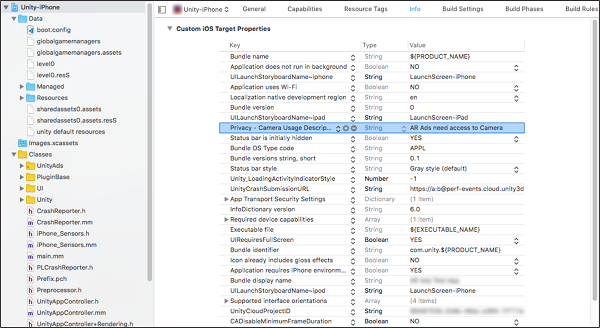 While Unity Ads will handle the camera query, you must ensure that any other permission requests (for example, accessing the microphone) occur prior to accessing the relevant component. If one of your Project’s plugins does not support this, you may experience crashes. Unity recommends thoroughly testing your implementation if you enable this option. This section details setting your game up for iOS or Android integration. If your game already uses AR functionality, skip to the Implementation section. AR ads requires access to the device’s camera. Once configured, the Unity Ads SDK can handle this permission query. iOS Add the Privacy - Camera Usage Description key to your game's Property List (Info.plist). For example, you can set the string value to "AR ads would like to access the camera". Implement a Placement that is dedicated for AR content. The Dashboard does not currently support enabling AR content. Instead, configure a Placement that you will not use for other content, using an easily identifiable Placement ID (Unity recommends ‘arPlacement’). In the final setup step, you will contact Unity to enable AR content for that Placement. Check for available AR content to fill your dedicated AR Placement. If yes, show content from the AR Placement. If no, show ad or Promo content from another Placement. See the following code examples. Note: For more information on implementing a callback handler, see documentation on C# Ads integration. Note: If your script already decides between multiple Placements, ensure that the dedicated AR Placement handling executes first. Rebuild your game. Your game should now be ready to receive AR content upon enabling it. iOS developers (Objective-C) The following example uses the UnityMonetization API (recommended) to retrieve a UMONPlacementContent object and show an AR ad. The code should be implemented as a delegate class for the UMONShowAdDelegate delegate. // Implement any custom logic related to returning from an AR ad. Please note that because AR content is loaded directly from our servers, AR ads only work in production mode, not test mode. The AR campaigns for integration testing may not reflect the final quality of the AR content. Remember to revert the test Game ID and Placement IDs to real production IDs before publishing your game. To get started, log in to the Acquire section of the Developer Dashboard and select the Organization that owns the Projects you wish to promote your app in. Note: If you wish to use Cross-Promotion but use more than one Organization for user acquisition and monetization, please contact Ads support for assistance. Each Organization may create up to two Campaigns. Select Cross promotion from the left navigation bar, then click CROSS-PROMOTE APP to choose a target Project. 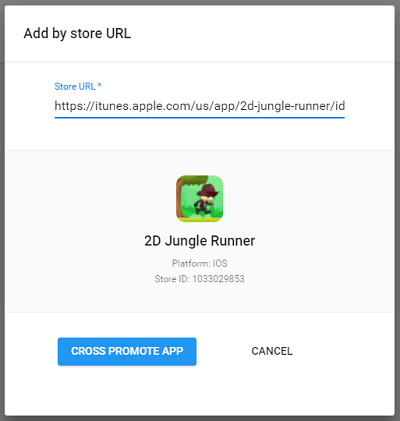 Select a target app to promote using a store URL lookup. The target Project must be published in an app store, so that users can click the ad to install the app. Click CROSS PROMOTE APP to verify the selection. Your selected app should now appear on the Cross promotion page. Click ADD PROMOTION to configure a new cross-promotion campaign. 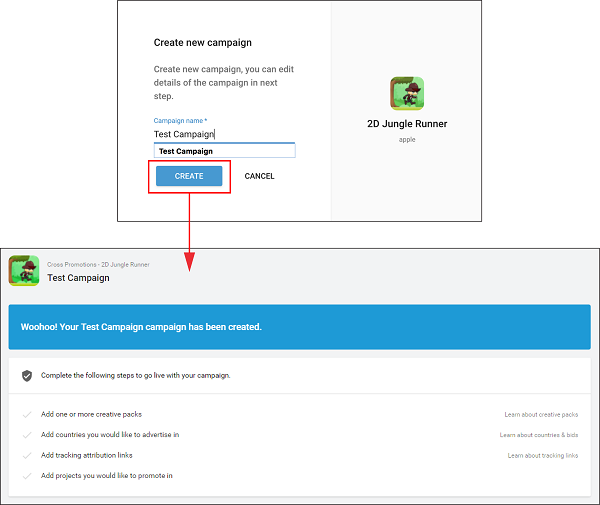 Name the campaign (for naming convention guidelines, see the Creating Campaigns section of the Configuring Campaigns documentation), then click CREATE to create the campaign. The process for setting up cross-promotion campaigns is similar to setting up normal ad campaigns. However, because cross-promotions use your own backfilled ad space, you do not enter bids or draw from an advertising budget. 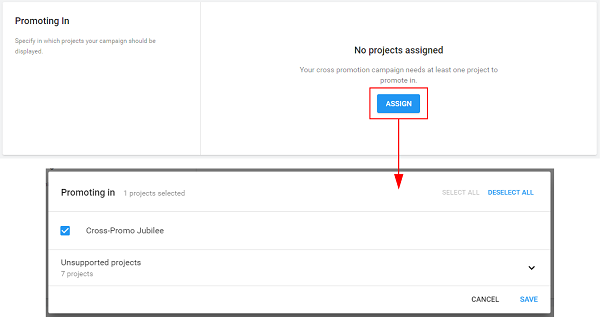 Navigate to the Promoting in section of the campaign configuration page, then click ASSIGN. Select as many published, Unity Ads-enabled Projects that you’d like to promote the target app. Note: Projects that do not meet this required are listed as unsupported. Remember that you must be logged in as a Project’s owner to select it as a cross-promotional option. Click SAVE to apply your selections. Adding creative packs Creative packs are the content of your cross-promotional campaign. Creative packs are covered in depth, including specs and setup instructions, in the Configuring Campaigns documentation. Note: While most advertising campaigns share creative assets from the same pool, cross-promotion campaigns draw from a separate resource. This means that even if you already created an ad campaign for the target app, you’ll still have to upload its creative assets to the cross-promotion configuration interface. Navigate to the Countries section of the campaign configuration page, then click ADD to bulk select countries, or use the search tool to find a specific country. Select as many countries as you’d like, then click ADD COUNTRIES to apply your selections. For more information on countries, see the Bids section of the Configuring Campaigns documentation. Note however that Cross-Promotions do not currently use bids, as you do not need to bid on your own ad space when you deliver Cross-Promotion as backfill. Schedule A valid Start date is required for your cross-promotional campaign. This field defaults to the current date. An End date is optional. Click here for more information on Scheduling settings. Click attribution is required, however Unity recommends using Start and Click attribution links in tandem to support higher conversion rates. Note: If you use multiple Organizations to cross-promote, please be sure to contact Ads support so they may ensure there are no complications with install tracking for your Campaigns. Click here for more information on Tracking links. Click here for more information on Campaign details settings. Click here for more information on Targeting settings.